Through miles of thick treeline and twisting blacktop roads lies a log cabin, but not just any log cabin. It was designed by a family in 1971, and the Lyon family bought it in 2000. The inside is all windows, and Marcia Lyon said she could never think of putting a curtain in. 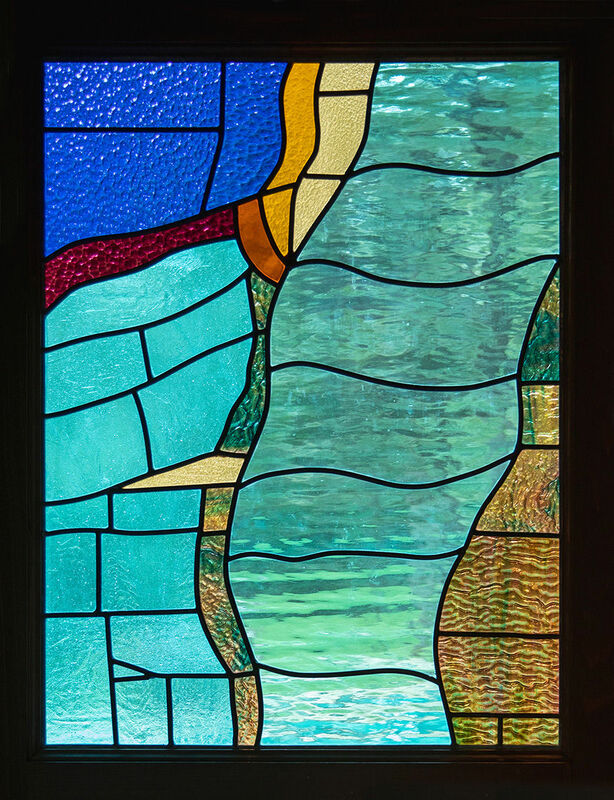 Instead, Lyon has specially designed pieces of stained glass lining the tops of the windows throughout her living room. The stained glass is sprinkled throughout the rest of the house. The first floor has a custom kitchen, and a living room with wall-to-wall windows. The guest room and bathroom have similarly soft lighting. Everything has a touch of wood with oranges and blues to complement the bits of Southwest flavor. When she and her husband first saw the house, it had flamestitch wallpaper, and Lyon said that had to go. When she sat down in the middle of the living room, she just felt natural. “I don’t want wallpaper with birds or anything; I just wanted it to look like outside, and then I’ll throw my colors on it,” Lyon said. The second floor has an open design, but Lyon said that hasn’t always been the case. One room used to be divided. Lyon said she thinks the bedroom was divided because two sisters used to live in it together, and they probably wanted each other to stay on “their side” of the room. The master bedroom overlooks the living room with a balcony that can be closed off by a large, wooden sliding door. The bathroom is large, and a skylight lights the shower. Lit in clear, natural light, the interior boasts art from everywhere. Lyon said she absolutely loves to buy art, wherever she goes, and she creates ceramic pieces herself with her kiln built in the backyard. Lyon said there is a story behind each piece of art she owns. “I tell all of my friends who are artists — don’t buy me anything. Paint me something, do something for me,” she said. The house sits on 25 acres, and it is paired with two smaller houses that the Lyon family uses as Air BnB locations. One is at the foot of the driveway to the main house. It was built in the early 1800s and used to be the main house on the property until the builder of the current house had it moved. Lyon said she is so glad he kept it intact because of all the historical significance. She has tried to renovate with as little modification to the original design as possible. Lyon said her favorite memories of this property are the many weddings that have gone on. Her children got married on the property, and many others have, as well. She loved to host them and let them stay in the guest houses and use the backyard. “It’s just like having a party with our friends; ya’ll get dressed up, and we’ll have a party,” she said. Her favorite part of the main house is the small reading nook in the living room with a shelf to the right where she displays her collection of unique tea pots, and a table and lamp to the left with a backdrop of large, clear windows.